If you are anything like me, you guiltily ticked all of the above. In fact, do you even know anybody these days who doesn’t fit this description? But fear not – you are not suffering from some rare brain disorder. According to Key Organization Systems you are merely suffering from Modern Life Syndrome, the cumulative effect of all sorts of modern malaises. Take attention span for instance. Lots of new research suggests that our constant use of the internet is affecting our ability to concentrate. We are bombarded with information and can skip with ease from topic to topic in a matter of seconds, and it turns out this overstimulation is bad for our ability to focus on one thing for any length of time. Shocker. Our tendency to increasingly interact with people online is also making us worse at interacting with them in person, but whereas nobody knows that you are also updating your Facebook status while Skyping with a friend, it does become painfully obvious in person when you zone out halfway through their sentence. More and more of us are involved in several projects simultaneously to try and avoid FOMO (fear of missing out), a form of social anxiety that makes you constantly worry that you might miss an opportunity for social interaction, a novel experience, profitable investment or other satisfying event. Apparently, according to Wikipedia, the fear is “especially associated with modern technologies such as mobile phones and social networking services such as Facebook and Twitter, which provide constant opportunity for comparison of one’s status”. Another shocker! And then of course there is my personal favourite, Stuffocation, a brilliant term coined by the writer James Wallman to describe the feeling of drowning in your possessions. Why do I have such trouble in getting organised? Oh yes – because every day I have to fight through piles of stuff that I don’t use to find the one thing I urgently need. But I have a dream. A dream in which both Nick and I turn off our computers and smartphones after 8pm and spend time actually having (gasp!) a conversation. Where I can read a book for an hour without the irresistible urge to check how many likes my latest Instagram post has; or even where I can spend an hour writing for my beloved blog without the urgent need to check what is happening on Facebook. Where I can turn down invitations with impunity, purely because I feel like lying on the sofa with my cats eating ice-cream rather than attending a networking function. And of course, a dream where I throw out my university notes; that pair of trousers that I loved in 2001 but have not fit into since 2004; that annoying chipped salad plate; and every single piece of the 10kg of carefully saved bubble wrap in the house. And then I serenely inhabit my clean – nay, minimalist – new dream existence, wearing clothes without droopy hems or missing buttons; sitting at a desk that is empty but for my computer, a scented candle, and a beautifully crafted pen that I can always find and that never runs out of ink; having regular long and meaningful conversations with my nearest and dearest, right after my daily hour of yoga. With a hot twentysomething male instructor who’s a dead ringer for Theo James. OK, so I may never actually achieve this goal of totally simplifying my life, but the area in which I can and do keep things simple is in the kitchen. After a day of shortening my attention span by switching constantly between by day job and blogger persona, nothing is more satisfying that a simple dish for dinner – something with clear, fresh flavours and not too many ingredients. Since Nick has started growing much of our vegetable supply on his allotment, we find that the flavours are so much fuller than store-bought vegetables that it is a pity to mask them with complicated cooking techniques and sauces. So when he recently brought home some fat beetroots, I simply rubbed them with olive oil and tossed them in the oven to slowly roast, caramelise and intensify their flavours. 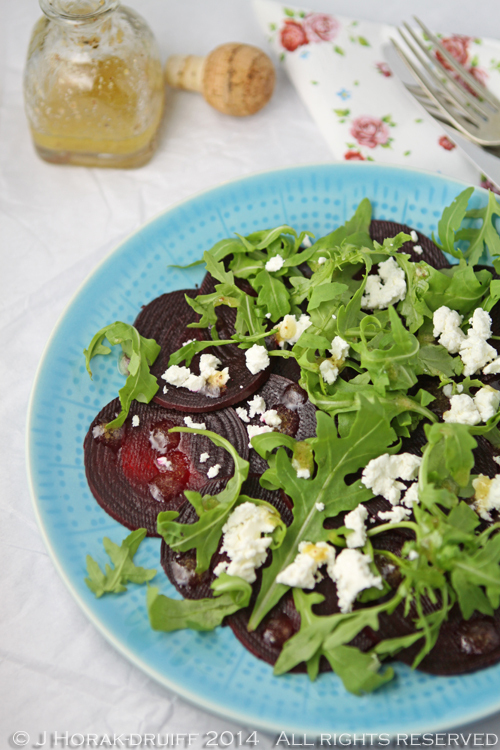 Once they were done, they became the star of this super-simple salad that combines the earthiness of beet with the creamy saltiness of feta, all given a little flavour lift by the tangy dressing and sharp wild rocket. Simple perfection. I’m sending this recipe over to Katie who is this month hosting the Simple and in Season event started by the lovely and talented Ren Behan. Pre-heat the oven to 180C. Trim the beets, scrub them and rub all over with olive oil. Roast in an ovenproof dish in the middle of the oven for about 90 minutes or until the beets are soft when pierced with a sharp knife. Allow the beets to cool, then peel and slice into very thin slices using a sharp knife. Divide the beet slices between four plates and arrange them in a single layer, but overlapping like roof tiles. Crumble the feta and scatter each plate with feta and rocket leaves. Place all the dressing ingredients in a bottle or shaker and shake vigorously until well mixed (adjust the oil or the lemon juice quantities if you are struggling to get it to emulsify). Drizzle over each plate (any leftover salad dressing can be stored in the fridge for up to a week). Serve immediately with good bread for mopping up the dressing. A beautiful salad! So colorful and refined. 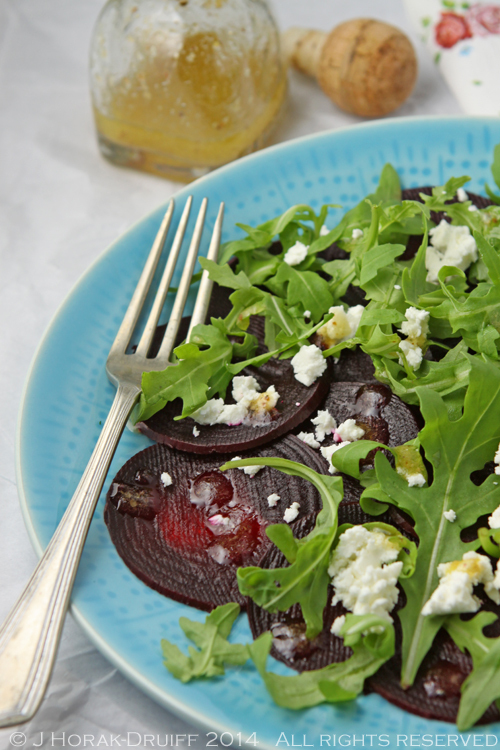 Beetroot, rocket and feta are some of my favorite foods. What a beautiful, simple salad – just the sort of thing needed when one is running around like a mad person trying to meet deadlines. I know what you mean about this Modern Life Syndrome – it feels like go, go, go at the moment and I just want to curl up on the couch and watch a film! Thanks for sharing my cupcake recipe too. I think I could truthfully tick all of the above. When did life get so crazy? I’m happy to dig into that salad. It’s got some of my favourite ingredients and I’m all in favour of simple. Thanks for linking to my salad. Ha ha! Modern Life Syndrome hooray… and there was I thinking that those problems were me suffering from early-onset old age! The one thing I definately DO NOT suffer from is Stuffication. When we packed up our home in London five years ago, after 35 years there, tons of stuff got ditched, given to our adult children, went to charity etc, and what was left was put in store. Now I live in Beijing, the stuff in store in the uk hasn’t seen the light of day for five years and I can hardly recall what there is, let alone want it. Getting rid of ‘Stuff’ is amazingly liberating, obviously one has one or two ‘treasured’ things, but apart from that, it is just ‘stuff’. Now I don’t have to spend time looking after it, I have time for new recipes, new experiences, new places to go, new people to meet. And I am 60+, if I can do it anyone can! 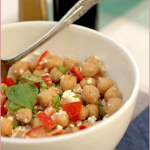 Am not sure why I am ranting on, just wanted to say I made this recipe the other evening and it was delish!! Thanks Jeanne. This is all so true. I am guilty of all the above, and I am sure that anyone who writes a blog and has any links to social media will feel the same. That is exactly why I look forward to holidays when I totally switch off. I have got better in the evenings but only because we have really got into Homeland so I will focus on that not my laptop! I also happen to love roasted beetroot in salads, soups and as a veggie. 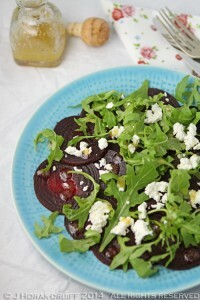 This salad and home grown beetroot sound perfect. No wonder you’re distracted if you even have a hot yoga teacher!! Rocket is my favourite leafy green to use in salads – it always makes them look so elegant! 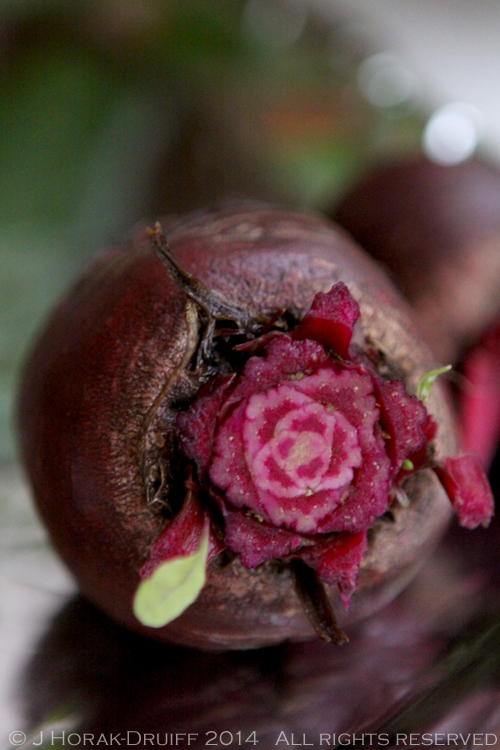 The beetroot is stunning too. Looks delish! A wise woman with a generous spirit once shared a few sobering words with me that continually redirect and steer me towards the balance that so often eludes me, “you can do all things, but not at the same time”. Your post so accurately describes our modern lifestyles and serve to remind us that every now and then, scaling back is both necessary and liberating. FETA! Damn and I’ve just ordered goats cheese from Ocado! 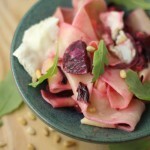 Thanks so much for entering your beautiful beetroot salad into this month’s round of Simple and in Season Jeanne! Loved your post about MLS and would love to try your dream too! Salad looks delish too!